The Comte d’Artois, younger brother of Louis XVI, loved beautiful women, but only one completely captured his heart. 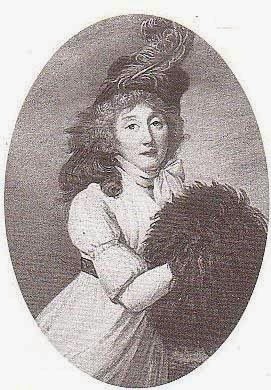 Her name was Louise d’Esparbès de Lussan. Born in 1764, Louise lost her mother shortly after her birth. Her grandmother raised her until she was 12, when she was then sent to the convent of Panthemont, where she remained for 5 years. 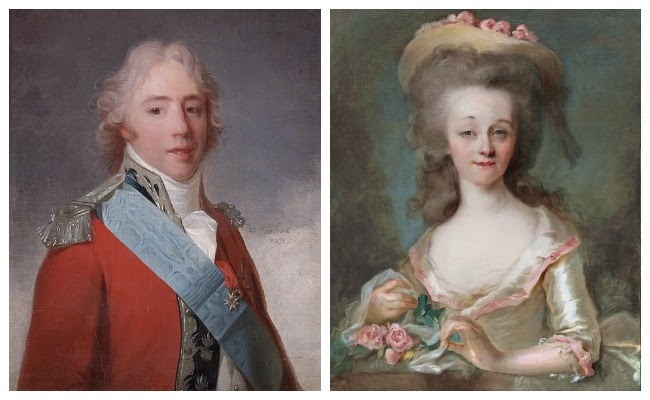 At the tender age of 17, Louise left the convent to marry Denis, Vicomte de Polastron, the brother of Gabrielle de Polignac, Marie Antoinette’s best friend and governess of the royal children. Gabrielle took an instant liking to the shy, sweet, and modest girl and got her a position as lady-in-waiting to the queen, with an apartment in the palace. “We shall be always together; she shall be not only a sister to me, but a cherished child,” Gabrielle said of her sister-in-law. Louise must have been grateful for that, especially because right after the wedding ceremony her husband, promoted to the rank of colonnel, had to leave to take command of his regiment. He’d be away for a whole year. Although Louis had Gabrielle to help her out at Versailles, her life at court didn’t start well. Her introduction to the Queen was a disaster. Everything had been carefully arranged. Louise was sumptuously dressed, her hair powdered, and instructed on how to curtsey. But when the fatal moment came, Louise forgot everything she had been taught. She simply stood there, frozen. She didn’t move even when the Queen embraced her. Her behaviour was a disgrace and soon became the talk of the court. All the courtiers avoided her, not wanting to be associated with her. One man, however, approached, and started talking to her. A dashing, charming man who chased all the pretty women at court, Artois was instantly smitten with the shy, gentle, and virtuous Louise. Suddenly he started spending a lot time in Madame de Polignac’s apartments to be close to Louise. Everyone knew what this meant (Marie Antoinette even warned Louise to be wary of the Comte’s attentions), but not Louise. She was too naive to understand what Artois’ intentions were. A year went by and Denis came back to court, and got his wife pregnant. She gave birth to a son, Louis. Louis XVI and Marie-Antoinette stood as godparents. Motherhood suited Louise. It brought her happiness and gave her a new-found confidence. Rather than being deterred, Artois was now more in love than ever before. He wrote Louise a passionate love letter, which only confused and distressed her. She showed it to a few trusted friends and the Queen, who told her to leave the court and move to Paris, and return to Versailles only on the days when she was “in waiting”. Artois was in despair, but didn’t give up. Instead, he took every opportunity to meet her, even if he couldn’t speak to her. One night he even disguised himself, wearing a big wing and riding coat, to attend the opera, knowing Louise would be there. His disguise didn’t fool anyone. It only managed to create a stir and confirm what everyone else already “knew”: the two were lovers. Louise felt very humiliated by these false rumours. Virtuous and faithful, she had no intention to betray her husband. Even though Denis could be difficult to live with, she was determined to avoid all temptations to stray. Things went on like this till July 1789, when both Artois and the Polignacs fled the country. Louise and her family went to Turin, where they heard of the money problems the Comte and his colony of émigrés, now in Germany, were facing. Louise asked her grandfather for her dowry money (it had never been paid), and, with her son and two servants in tow, went to Coblentz. Her arrival caused as a sensation. Artois couldn’t believe his eyes. He had resigned himself to never see her again, and there she was. He was touched by her gesture, but also understood that her actions would be interpreted by the gossips as proof she was his lover. And soon, she really would be. By the time Artois and his court had settled at Holyrood Palace, Edinburgh, the couple was openly living together. Their relationship brought Louise joy but also sorrow. A deeply pious and virtuous woman, living a life that went against her moral principles didn’t allow her conscience to rest easy. But she and Artois were so much in love, there was no turning back now. Louise and Artois would occasionally go to London, where the Comte would gamble, hoping to raise some money, as his income was so small and his debts mounting. It’s on one of those trips, in 1804, that Madame de Gontaut, a cousin of Louise who hadn’t seen her in ages, realised there was something wrong with Artoi’s mistress. Louise was pale and coughed a lot. Apparently noone else, not even Artois had noticed. 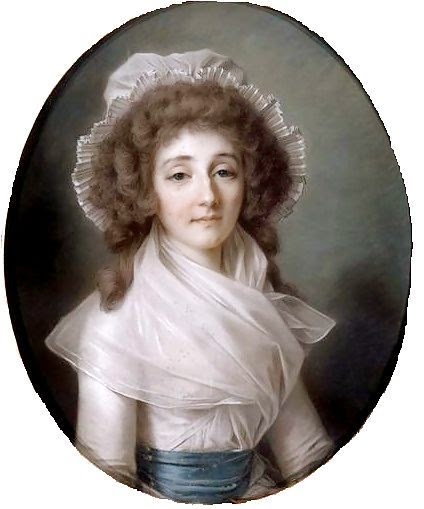 Madame de Gontaut, though, took Louise to the King’s doctor, who diagnosed her with consumption. She didn’t have long left to live. Artois was devastated. Louise needed rest and calm, so Madame de Gontaut found a house in the country for her. But her conscience couldn’t find peace, so a priest was summoned. He reassured Louise that God would forgive her sins, but only if she gave up Artois and never saw him again. The poor woman agreed on one condition. That she might at least be able to see him one last time on her deathbed. The priest agreed. Artois, his heart broken, left. He would be back a week later, when he was quickly summoned at her bedside as Louise lay dying. As a last favour, Louise asked Artois to give himself entirely to God. He agreed. After her death, Artois repented and even took a vow of chastity, which he kept for the rest of his life.